A chocolate fondue party is a wonderful way to get everyone involved in the fun of indulging their taste buds. If you have never been to a fondue party, don't be afraid to host one of your own! You don't know what you are missing. 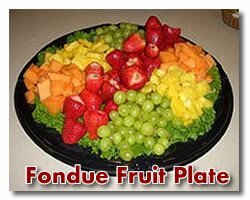 Fondue comes from the French word "fondre" which means "to melt." It also has the meaning of "food cooked in a central pot." Chocolate fondues are usually made by combining chocolate, cream, and a choice of extracts, spices, or liqueurs for variety. There is a whole range of different chocolate fondue recipes that you can choose from to make your party interesting and to tempt everyone's taste buds. Of course, you may have seen a gorgeous chocolate fountain at a wedding or other special event. A chocolate fountain is simply a fancier way of presenting fondue, in my opinion. However, if you decide to use a chocolate fondue fountain, you usually do NOT add extra ingredients to your chocolate (except for oil or cocoa butter if needed; depending on the chocolate you use), so there is a difference. Here's a bit more info about chocolate for fountains. Okay, now that we've got the chocolate covered, let's talk about the tasty morsels you can prepare for dipping. Usually people think of strawberries immediately since chocolate covered strawberries are a traditional romantic combination. But don't stop there! Arrange bite-size chunks of a variety of fruits such as pineapple, strawberries, cherries, dates, orange slices, melon, grapes, pears, apples, kiwi, and bananas. Imagine the various flavor combinations your guests can create! (Special Note: If you pre-slice the apples, pears, or bananas, be sure to dip them or sprinkle them in lemon or pineapple juice to prevent discoloration). For even more variety, you can prepare another selection of items that are perfect for double-dipping! After your guests have drenched their chosen food in chocolate, they can quickly roll them in one of your bowls of granola, chopped nuts, or coconut. Now you're really starting to get decadent! Getting hungry yet? :) I am! Get yourself a fondue pot and accessories and give it a try. Fondue is great for parties, but don't cheat your family. Have a fondue night just for them. What a great way to start a family tradition. I hope you will enjoy my collection of chocolate fondue recipes. You may want to experiment with some of your own variations that will appeal to your own particular tastes. If you come up with a real winner, pass it on to me so the rest of us can give it a try. Happy Splurging! 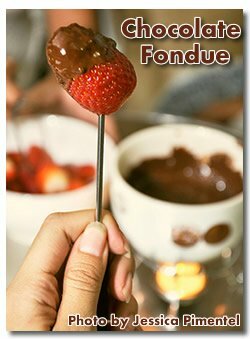 You know by now that I am somewhat partial to chocolate, but it is only fair to mention, as I hinted at earlier, that there are other types of fondue that can be made. If you are interested in expanding your horizons in that area, why not visit Easy Appetizer Recipes? They have a selection of delicious, easy appetizer recipes for all kinds of occasions, and a lovely section especially on fondue and fondue recipes.